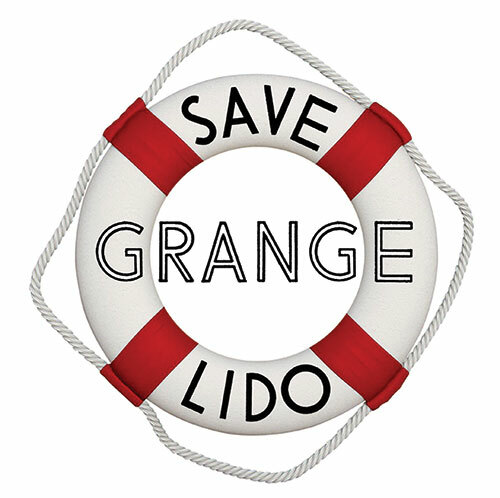 Highlight of the week… Of course, this was on Wednesday 19th September, when Save Grange Lido (SGL) representatives attended the Grange Council Chambers in Victoria Hall. Present were Councillors from South Lakeland District Council (SLDC), Grange Town Council (GTC) and Cumbria County Council (CCC) along with Council staff and an architect. SGL Chairman Phil Bradby and Steve Trevillion presented the preliminary business plan that they had prepared after 6 months of hard work. The plan clearly shows that it is viable for the beautiful Lido to be restored as an outdoor swimming facility on a long-term basis. This would take away the current burden on the taxpayer, whilst bringing an attractive return annually for the community. Long term it would not become a further “white elephant” or burden on the council and the residents of SLDC. Restoring the building as a pool and opening it as a Lido along with the other proposals within the plan, creating new jobs and boosting business in the area, revitalising Grange. It would result in a fantastic tourist attraction, a focal point for the community to be proud of, whilst also being an excellent health and wellbeing facility for both residents and visitors alike. SGL made it clear that they were keen to work with Grange (TC) & SLDC to restore the Lido its’ former glory and beyond. During the meeting the head of SLDC, Councillor Giles Archibald agreed that SGL would be allowed access to the Lido. This means that our experts can examine the pool and buildings so accurate costings and plans could be prepared. It was also confirmed that SLDC were working in partnership with Grange Lido CIC on the Lido with a “soft touch” restoration, including an “infill”. The CIC was incorporated in April this year by SLDC Chairman, Councillor Eric Morell & GTC Mayor /Chairman, Councillor Peter Endsor & Councillor Clare Logan, with one other member. When asked for a business plan it was clear that currently they don’t have one to support their proposal. They did however agree to present their plan when completed to SGL at a date to be arranged. SGL left the meeting feel they had made some progress and embraced the prospect of having access to the pool to obtain the details for the true projected capital costs of the restoration. This was later followed up on BBC Radio Cumbria, with Deputy Leader, SLDC Councillor Jonathan Brook, proposing a “light touch” restoration that would cost £2million and further stating that if you go to the next stage and “rewater” that you are probably “quadrupling” that cost. This is in total contrast to extensive research that SGL have done with other Lido’s that have been restored and not even supported by SLDC’s own feasibility studies. Our early indications from experts in the field are that this figure has been well inflated and is not substantiated. SGL member Steve Trevillion was interviewed on BBC Radio Cumbria on two occasions this week prior to and after the plan was presented. The interviews gave an accurate and true reflection of the position and the plan all of which are corroborated by research, facts and figures. 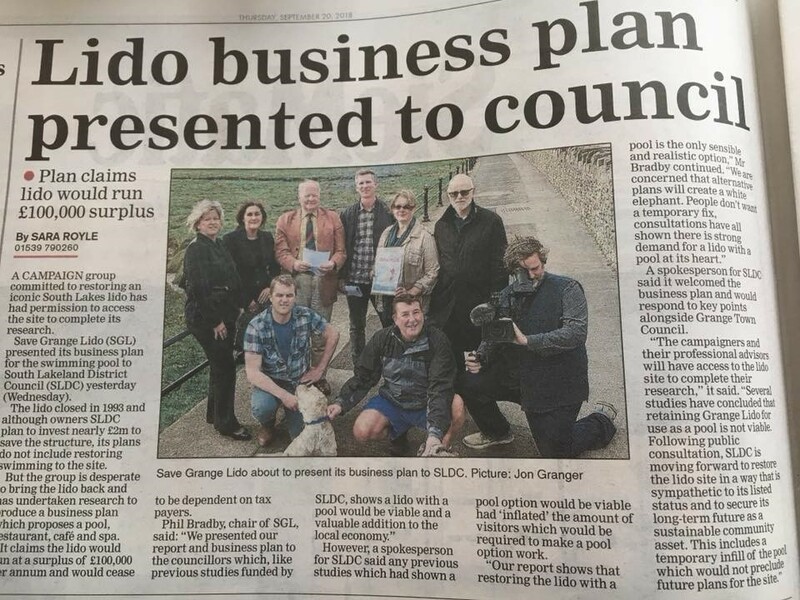 Earlier in the week Councillor James Airey & the Westmorland Conservatives showed initial support of SGL with a release on their website asking the Council to explore all options on the Lido and South Lakes. Labour have already given their full support for the Lido to be restored as a swimming pool along with the other facilities SGL have suggested on the site. There was a lot of press & media coverage with articles appearing in the Westmorland Gazette and North West evening news and a lot of social media activity. On Sunday the hand signed petition to SLDC closed. Counting to date shows that the 1,000 signature target needed for it to be presented to the Council has easily been reached and exceeded. The counting continues this week. Thank you to very much to everyone who supported and signed the petitions, including the many people and businesses that helped with the petitioning. If you would like to further support then please either e-mail or write to your local councillor. Sign up to our newsletter & of course, follow the news & updates as they happen on our FaceBook and Twitter pages. Next Next post: January 2019 Update – We’ve got a great year ahead!